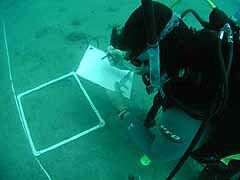 Experience: Mr Pefanis - Vassilatos didn't finish his career being an Instructor, he managed to get an Apex Equipment Specialist and also to become a Aquarium Diver Distictive Speciality Instructor. Research Activities: Mr Pefanis - Vassilatos starting cooperating with the Cretaquarium and the Hellenic Center of Marine Research while he started instructing divers to achieve the Aquarium Speciality in order for them to work in the aquarium tanks.He has continue his cooperation with HCMR and he is currently working with the Hellenic Center of Marine Research in Athens, and specializes about scientific diving and scientific diving procedures. His main scientific interests are about methods of taking samples, using techniques like the Corer for sand and soft sendiment, making measurements about salinity, currents and water ingridients using specialized materials. 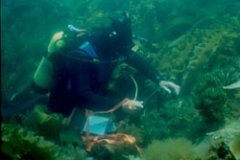 He is also interested in making passive research without taking samples and dirstubing the bottom composition, and has used these techniques in measuring and monotoring the posidonia population and growth. He has helped also in organizing the scientific diver seminar in HCMR in Crete 2006.